The blog is going for a walk on the beach, which is another way of saying we’re taking a little break. We shall we back Nov. 1. Lots of good stuff coming up. Stay tuned, and have a happy Halloween. When I first started thinking about potential topics for this blog, one of the original ideas on the to-do list was to write about nemesis holes – you know, those holes that seem to have your number time and time again, or, in the spirit of Halloween, haunt you. Anyway, nemesis holes both fascinate and frustrate me, and I had one very notable one (which I’ll write about in a later post) that dogged me for a decade that inspired me to write about this whole concept. When I think about nemesis holes, I break them down into two types: There are the ones that prey on a fundamental deficiency in your game (say long irons, or your ball flight off the tee), and then those that are well within your ability yet bedevil you over and over for again for reasons that are unclear and then become purely psychological. The hole I’m writing about today falls into that second category. 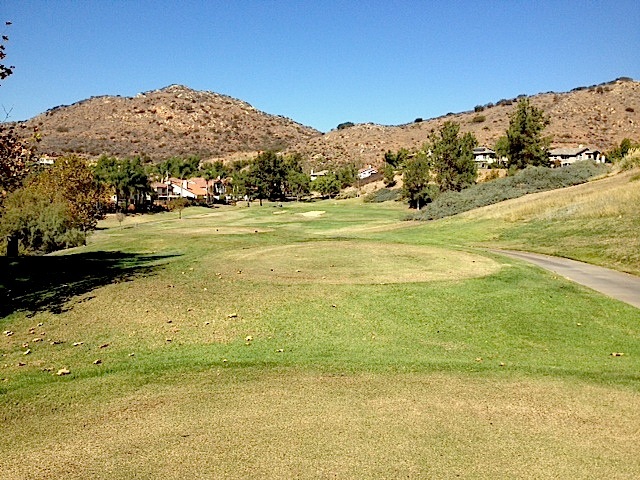 I played Eagle Crest in Escondido on Thursday for the first time in months. It’s under new management and the new staff includes two former mentors of mine at golf school. I probably played Eagle Crest a dozen times in school and always enjoyed the layout and the overall length of the course. It really challenges you off the tee and then challenges you to make smart decisions on your second shots. I learned a lot about the game, and my game, by playing here. One hole that I never figured out, however, and became a reoccurring train wreck for me, was the par-3 7th. The hole sets up like this: 197 yards from the back tees from an elevated tee to a diagonal oblong green, with traps in front and back. 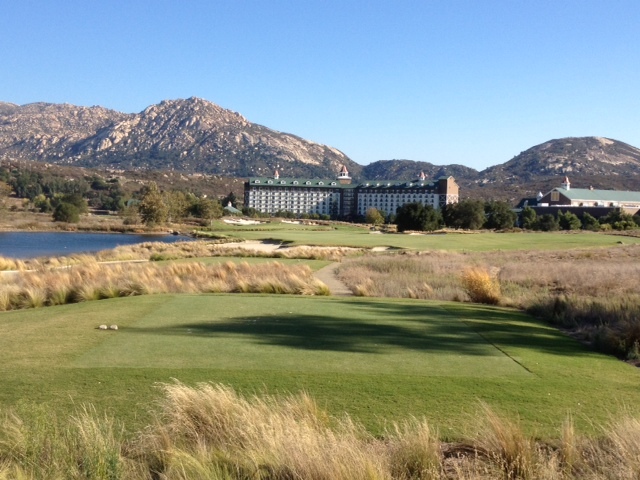 The hole is pictured above, but what it doesn’t show – and that you can’t see from tee – is a hidden bunker on the right. I know this bunker well because my tee shot has found it over and over … and over. It’s the “Groundhog Day” of golf holes for me. Why this happens is beyond me. I can only figure it has something to do with wind, but I can tell you clubbing up or down one has only changed the outcome in that I come up short. I honestly don’t believe I’ve ever hit this green in regulation. I played this hole again on Thursday, and this time I was paired with one of my former instructors, Kevin Connole, the new director of instruction at Eagle Crest. And that’s it. I’ve got such a history with this hole that it is all mental. At this point, Kevin switched into Bob Rotella mode and explained how you go about breaking the pre-programmed bogey funk a nemesis hole puts you in. Then he really got my attention. Hmmm, I got a D in Abnormal Psychology in college, but I’m listening. Part of the illogic here is that a draw is my dominant shot shape. It just never seems to show up on this hole. I would’ve needed another club to hit that bunker Kevin suggested, but I stuck with my 5 and swung away. The ball started at the target bunker and then did a gradual, soft fade right at the flag before landing 15 feet from the pin. I took a practice par and gained a new strategy for next time. Thanks, Kevin. Anyway, it’s stories and strategies like this that I hope will drive this series. I’ve had other nemesis holes successes with other strategies that I look forward to writing about. 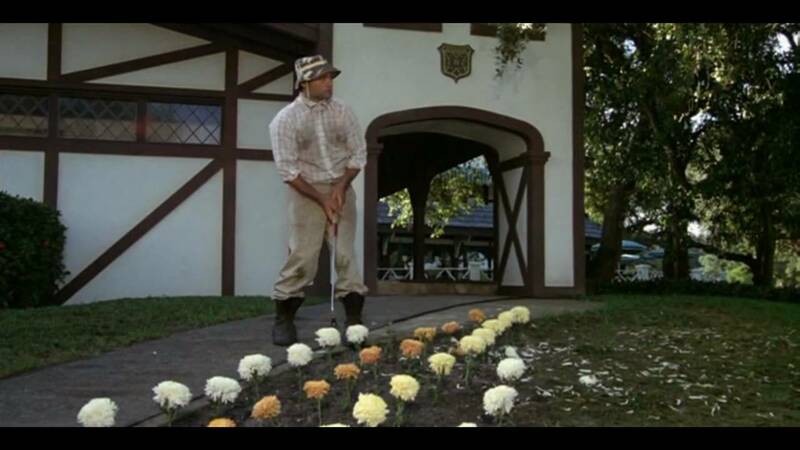 Hopefully with a little input, and professional supervision, we can put our bogeys and brains together and maybe all knock a few strokes off our cards. The green view of No. 5. 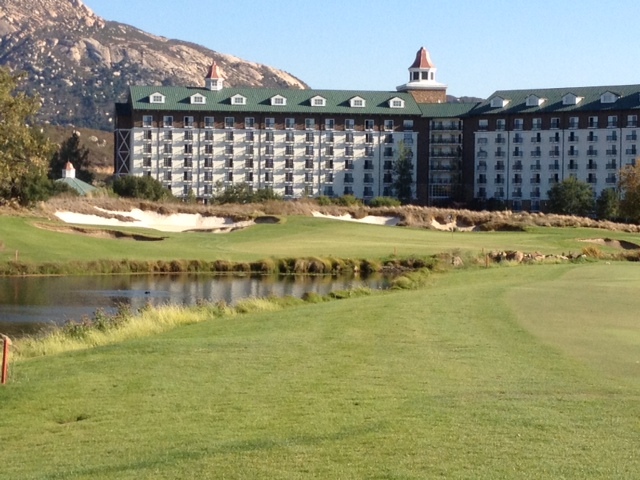 Photo courtesy of Monarch Beach. Holes No. 3 and 4, the ocean holes at Monarch Beach in Dana Point, are the highlight of any round at this Ritz-Carlton resort course, and deservedly so. Both holes – the short dogleg par-4 played toward the ocean, followed by a mid-length par-3 away – make wonderful and memorable use of the landscape to provide the epitome of the ocean-side golf experience. Standing on the tee at No. 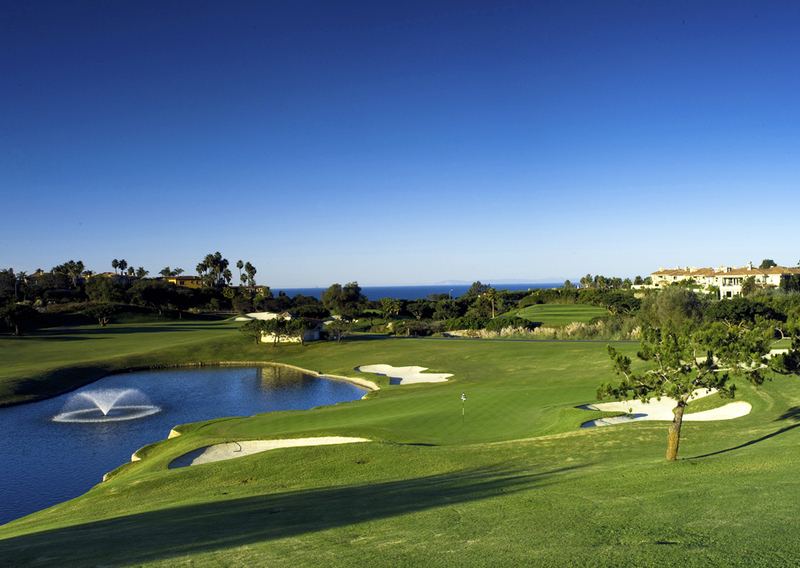 3, you can see the ocean and nearly hear the waves crashing to provide the sort of spine-tingling golf experience only a select group of California courses can deliver. They’re relatively easy holes (the Nos. 17 and 15 handicap, respectively), but that’s no criticism because going double-double here would be kind of a buzzkill. What follows is a long par-3 that welcomes you back from your two-hole golf vacation with a rude reality check to kick off what I think is the toughest stretch of the course. Holes 5, 6 (par-4) and 7 (par-5) can send your scorecard up in flames and have you thumbing through camera phone photos of the ocean holes reminiscing about the good old days of your round before you even make the turn. No. 5 plays 193 yards from the gold tees and 217 from the tips and has a beauty-and-the-beast complex. First, the beauty. You’ve got Monarch’s palatial clubhouse as a backdrop and a pond with a fountain on the right. Sand traps frame the hole on the left (you’ll notice this one’s shaped liked a butterfly as many on the course are) and back right. It’s a gorgeous golf hole and would likely be the signature hole on many other courses and possibly here were it not for the holes that precede it. The course GPS tells you that Fred Couples regards this as one of his favorite par-3s, and one of the toughest. Now, the beast. The length alone is a test, but if there’s wind, it’s likely to be at your back – although I’ve played it into the wind, which I’ll discuss in a bit – so wind isn’t a huge issue here. The green is. The green is tiered and severely sloped. When the pin is front right, you’ve got to challenge the water to get close and then hope you don’t reach the top tier, because the putt downhill is like trying to stop a bullet train. So a solid tee shot sometimes isn’t a guarantee of anything here. Placement is critical. And as you can imagine, chipping into this green is a risky proposition as well when the pin is near the pond. I’ll always remember the first time I played this hole. I had just moved out and discovered Monarch by catching a glimpse of it from the PCH. Not knowing the quality of the course I stumbled into, I was blown away just standing in the pro shop. I had a solid round, with my tee shot on No. 5 being the highlight. I fired safely at the left side of the green and watched the ball climb the slope, trail right across the top of the green and do a u-turn to gentle settle in 6 feet from the pin. I like to think of that has my Fred Couples moment. My two return trips have mostly been successful here, but I’ve watched other golfers playing this hole for the first time blow-up, usually helplessly watching their tee shot drift right into the drink. I played Monarch last November for my birthday and experienced it under windy conditions for the first time. It put some serious teeth into a few holes, especially the par-3s. While warming up for my round, I noted the wind and deduced that No. 5 would be playing into it. Anticipating clubbing up one or even two, I took some warm-up swings with my 3-iron, and the practice paid off. Monarch doesn’t have a range, but I suggest hitting a few into the net with your long irons to prepare you for No. 5 so you’ll hopefully have a pretty number on your scorecard to go along with those pretty pictures you just took of the ocean. When I moved out to California last year, I was looking forward to taking up hiking. I’d done it on previous vacations and found it an exhilarating way to explore the boundless beauty of our state in its many forms. I stuck to my plan for the first two weeks of my move, hiking Roy Rogers State Park and The Pallisades in LA, but then I got down coast and something (OK, tee times) distracted me from my goal. I’m not big on resolutions, but I’ve made hiking more one of them for 2014. Even though I live here now, I’ve tried to maintain a vacation’s curiosity about California, and hiking is a one of the healthiest and most cost-effective ways outlets for that. 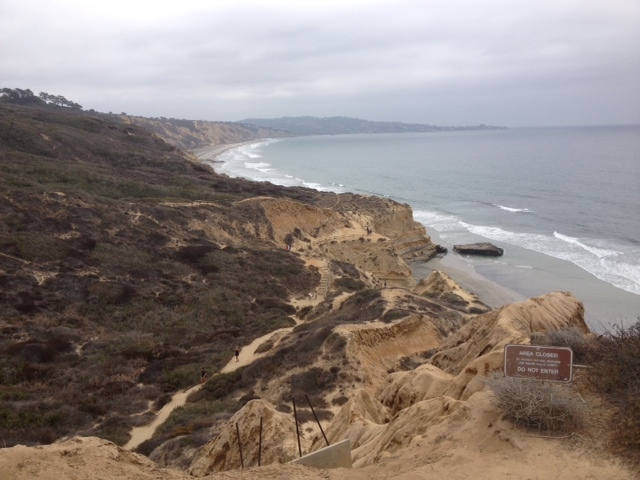 To renew my resolve and seek some inspiration and motivation, I recently undertook the first hike that was recommended to me when I moved out – the state park at Torrey Pines. I’ve walked both of Torrey’s golf courses and each time I looked at the ocean views and the vistas and wondered how much the landscape had in common with the state park. It turns out, not surprisingly, quite a bit, although the state park has many unique and wonderful surprises of its own. I ventured out on a day in September when the marine layer lingered long into the afternoon, which kept the temperature ideal for a hike. 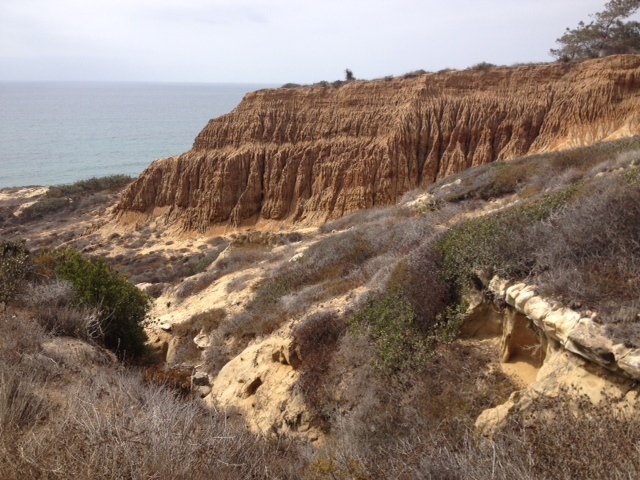 I drove the PCH down to the park entrance just north of La Jolla and the golf course, paid my $15, grabbed a map and went exploring with water bottle in hand. I discovered that the park consists of 2,000 acres that is best navigated by six trails of varying difficulty, distance and destinations. For instance, the Beach Trail takes you to the beach, while High Point Trail leads you to a viewing area with a panoramic view of the ocean and the reserve itself. I didn’t walk all six trails so if you’re looking for a definitive trail guide, you’re better off going to the state’s online trail guide at www.torreypine.org. I wanted to keep my hike to two hours and leave some of the park to explore later. The first trail you encounter is the Guy Fleming Trail, which is supposedly the easiest of the hikes and consists of a 2/3-mile loop through the forest and along ocean bluffs. Considering it’s the most easily accessible trail, I left that one for another day when I might not have as much time to explore available to me. I chose the Beach Trail, although I experienced other trails on the way there and the way back, including a portion of the hike where I wasn’t totally sure where I was. The trails are marked quite well on the way down and not quite as well on the way back, although the fault was probably entirely mine. If you know me at all, you know I could get lost in my driveway without a GPS. I had a map, but a map only helps if you can absolutely ascertain where you are. Anyway, in a roundabout way, I guess what I’m saying is that if it’s your first time, I’d recommended taking a hiking partner, although you can’t certainly do it on your own, even if you’re directionally challenged like me. I encountered several experienced fellow hikers who were only too happy to point me in the right direction. One of the first things you encounter on your hike is a display explaining how the park came to be. 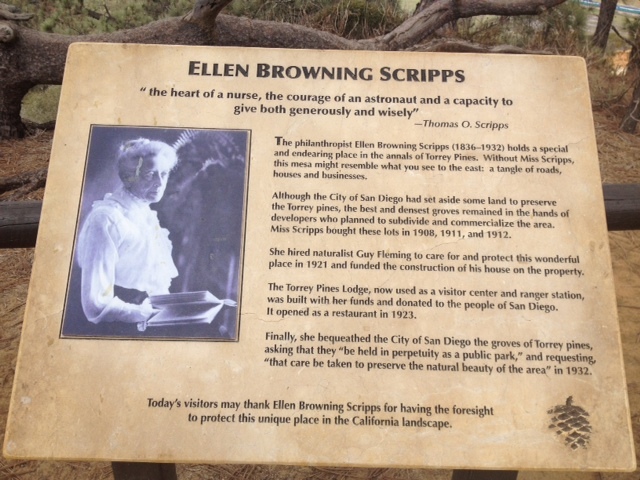 The story I’ve inserted below tells the story, so I won’t bother repeating it, but it’s obviously quite a vision she had and a contribution that Ellen Browning Scripps made to have this land set aside and protected from development to ensure that future generations can enjoy this scenic and unique portion of the California coast line. After learning the story of the park, I set out to experience it, and after about 45 minutes of a slow, winding decent down sandy trails and through desert scape, I arrived at my desired destination – the beach, or at least the area overlooking it. You actually experience the beach from the several viewpoints, and each of them gives you a different appreciation for this area is and how it came to be. 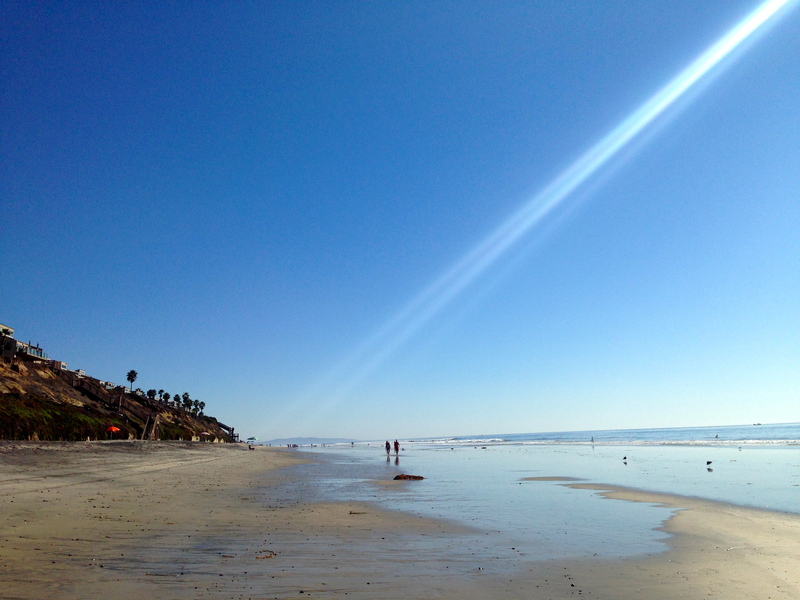 And this is the major difference from the golf course, where you occasionally overlook the ocean, the beach and La Jolla, but you don’t come nearly this close. At the reserve, you can actually walk on the beach. The first close-up view of the beach I got was from maybe a few hundred feet above. You can see all along the coastline and look down on the giant black rock formation that seems a destination unto itself for many hikers. While taking in the view, a fellow hiker informed me that this area represents the best opportunity to view dolphins in the park, he said, and, for that matter, along the entire coastline. Apparently there’s a kelp bed that hosts a huge fish population, which draws the dolphins to feed. Unfortunately, on the day of my hike we didn’t see dolphins, but that didn’t stop me from looking for a good half hour or so. When they are there, this has to be one of the best ways to experience them. I can’t imagine too many better vantage points. From that perch, the trail continues to spiral down to the beach, and you eventually pass a part of the trail where you have to traverse a small sand dune. 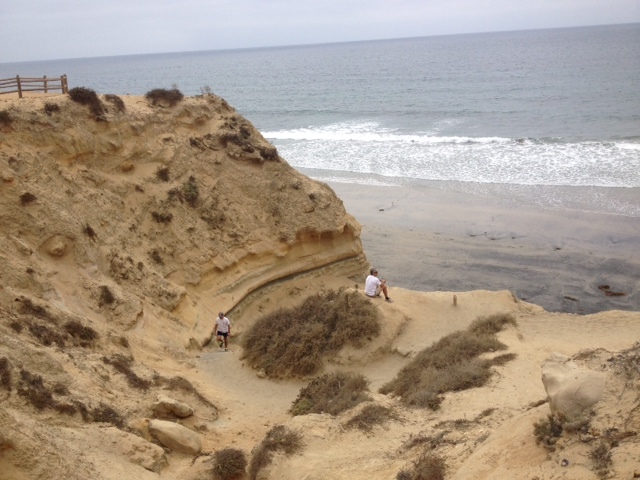 This is actually new beach being created, a slow and steady erosion process that the park’s helpful signs explain. I’ll let my photos speak for my experience here, but I’ll just say I can only imagine how awesome this area is around dusk or sunset, although you wouldn’t want to be there, given that you’d be hiking back for a good 45 minutes in the dark. If you’ve walked the golf course, the bluffs, vistas and topography in general will be familiar to you, but it’s presented in a less manicured and entirely native way that gives you a new appreciation of the area. I, for one, am glad I traded my golf spikes for tennis shoes to experience it and can’t wait to go back. I’m not sure how many other golfers do the same, but I absolutely recommend it. It’s a little more arduous than, say, looping the North Course, but it’s a rewarding walk all of its own and one I look forward to taking again very soon. 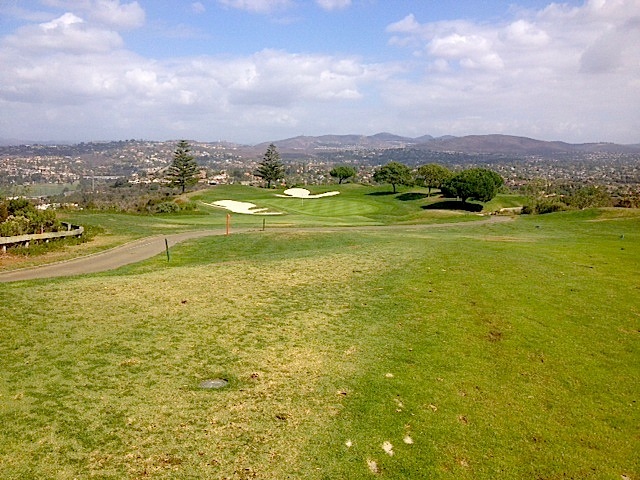 For the most part, Encinitas Ranch is a fairly straightforward golf course. What you see is what you get. The one exception is the par-4 No. 7. No. 7 is the only truly blind tee shot on the course, and it’s one of those quirky layup holes that’s tough to club right and can be quite penal if you club it wrong. The tricky tee shot colors how a lot of people view this hole, which is unfortunate since it closes with (besides the ocean) probably the most impressive view on the course – a green ringed by gorgeous trees set against a stunning panoramic view of the valley. Let’s say this: If it was a par-3, I think people would think more highly of this hole. The only thing you see from the tee is a fairway that comes to a plateau. In the middle of the fairway is a tall, red aiming pole. What you don’t see is a dramatic downslope past the pole that narrows significantly on the left, so much so that if you carry the hill on the left, you’re destined to go OB into a canyon, likely with the help of the cart path. So we want to be right, right? Yes. And long. Because if you’re short, you’ve got another blind shot for an approach. Anyway, I think the mistake people make here is thinking everything rides on the tee shot. The other day, for instance, I hit a solid hybrid that the wind trapped and sent back down the hill, leaving me 170 yards or so out. I walked up the hill, chose my aim line and then walked back and dropped a 6-iron approach onto the front of the green and made a two-putt par. I recall another blind approach I hit here that nearly found the hole. Remember those trees behind the green? They’re your friends. Pick one as your aim line, trust it and hit your shot. But knock off a club for the elevation unless you’re into the wind. I’ve seen people fly approaches into the back traps and that’s not an out you want. So I guess the moral is, don’t sweat the tee shot, embrace the challenge if your second shot is blind and don’t forget to appreciate the view regardless of what ultimately goes on your scorecard. 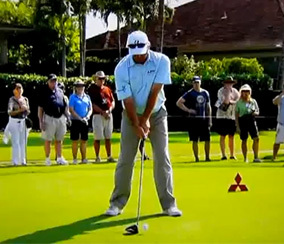 Martin Hall gave a tip on the Golf Channel’s School of Golf recently that I’ve been reminding myself of a lot lately so I thought I’d pass it along. The tip I noticed that he gave, and one that has really helped me, was about setting your shoulder tilt. Shoulder tilt is critical for every swing but especially the driver swing because the optimal attack angle for a driver is one degree up. That’s hard to achieve if your shoulders are level, and impossible if you’ve dipped your front shoulder. Where I go wrong in my setup sometimes is having my shoulders too level, and I know immediately when it has happened because my right shoulder will roll over on my follow through and I’ll hit a huge pull right. That simple act sets my shoulders at the proper angle to deliver the slightly ascending blow critical for driver distance. Remember this the next time your drives are going awry, and especially if you’re taking a divot or striking the ground, because it might be the reason why. You know a golf course has been around a long time when it has a Ben Hogan story. Having been established in 1919, venerable Wilshire Country Club in Los Angeles is that type of place. I played there for a charity event on Monday and was clued in on the lore of Ben Hogan, the ninth hole and the Hollywood sign. The ninth is a 418-yard dogleg-left par-4 that begins with a blind tee shot. 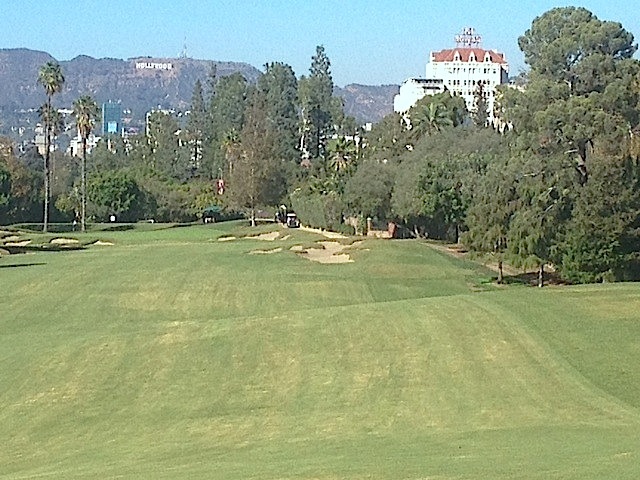 Wilshire CC is located in the shadow of the Hollywood sign, which is visible at several points on the course but most prominently on No. 9 because it’s part of the backdrop, as is the sign for the high-rise El Royale apartment building, which you see on the right. The green is visually located beneath the Hollywood sign. The story I was told by my playing partner actually involves the El Royale sign, but I searched online and found an LA Times story that says it’s actually the Hollywood sign, which makes more sense, but the gist is the same. I played No. 9 by hitting my usual draw and hoping it would follow the fairway. It didn’t. We found it on the right side in some very thick rough and I got to chop it out from 175 yards. My approach was left and fortunately found a rare safe landing spot amongst the myriad of bunkers that guard this hole and, for that matter, every hole at Wilshire. It’s the most severely bunkered course I’ve ever played and fortunately the format we played has us rarely playing out of them. Anyway, after a pitch and a tricky two-putt, I took 5 on No. 9, but walked off happy to have had the experience of following in the footsteps of a golf legend. Thanks to the staff at Wilshire for being gracious hosts for a quintessential LA golf experience and thanks also to the charity sponsor, Prototypes, which advocates for mothers with children who are going through recovery to keep their children out of foster care. This was their fourth annual tournament. I’ll be providing additional information about the event in a separate post. For whatever reason, it didn’t dawn on me until about 10 minutes before we teed off at Sherwood on Monday that we’d have caddies. If it had, I would’ve been 10 times more excited than the 10 times more excited I already was than for a normal round of golf. Caddies are such a great way to experience the game, and a luxury I’ve rarely been afforded, but one that I think would hook more people on the game if they got to experience it even once. When you hire a caddie, you’re also hiring a tour guide, a swing coach, a greens guru, a motivational speaker, a cheerleader, a comedian, a personal assistant and more all rolled into one. In my experience, it’s a guaranteed good time, and an always memorable one, on the golf course when you have a caddie. The first time I ever had a caddie was when I played in Jamaica, where Jamaican law requires you to play with a caddie. Our caddy’s name was Devon, and he looked like he could’ve walked right off the course from a 1970s Masters, white coveralls and all. Anyway, I didn’t totally know what type of experience I was in for with him, but I got a pretty good idea on my first tee shot, which I hooked high into the palm trees on the mountain on the first hole. Cool! Throughout the round, Devon was basically a walking GPS, previewing holes, giving me yardages, reading my putts and at the same time, basically teaching beginner’s golf to my playing partner, all while cleaning our clubs. He balanced it all remarkably well. Anyway, I recall it being a very relaxed round and so much fun that we went back the next day. And that’s when I hit the shot I recall most. While playing a long par-3, I carved a 5-wood incredibly close to the hole, or so it looked to me from the tee. Doubt started to creep in though because my caddie, a man with a line for every golf shot under the sun, was silent. Finally, he approached me on the tee, took my 5-wood and handed me my putter. “They always say the pro walks off the tee carrying his putter,” he told me, making me feel 10 feet tall walking off the box. It turned out that the putt was much more than a tap-in, but I still saved par, and it was my hole of the trip, largely because Devon made it so. So when a caddie named Bruce hopped into my cart on Monday, it automatically gave me a good vibe about how the round would go, regardless of the score. And, truth be told, at the beginning, it didn’t go well, but Bruce made that part memorable, too. On the third hole, I hit a rare slice off the tee and way OB right into the backyard one of the multi-million-dollar homes. As I handed Bruce my club, he provided an interesting piece of course knowledge. “Well, if it makes you feel any better, that’s the backyard of Britney Spears’ old house,” he said. My round turned around on the fourth hole, where Bruce’s read of a tough uphill breaking putt helped me make birdie, and a great golf day ensued from there. Sherwood was a spectacular, borderline surreal, golf experience for me, and undoubtedly one of the five best courses I’ve ever played. I would’ve enjoyed the day regardless of how I played, but my scorecard probably would’ve looked drastically different were it not for Bruce’s guidance. I’ve come to think of a good caddy as being like a good personal trainer: they get that 10 to 15 percent more out of you that’s hard to get out of yourself. That certainly happened on the back nine, where it felt like Bruce had seen me swing enough to that he knew how to club me and what shots to recommend. I hit an uncommon number of good golf shots over those nine holes, but none better than on the last two. Our next-to-last hole was a 491-yard par-5 with a green fronted by a creek. The play off the tee was to hit the left side of the fairway and let it roll right. I hit my best tee shot of the day and actually carried it past the suggested landing area. That left me 230 out, prime yardage to get home in two with my hybrid, and Bruce was giving me the green light all the way. And I was only too willing, largely because I’d botched a similar shot on a previous par-5 off a perfect lie. This lie, however, wasn’t so perfect. It was a bit of a side hill and especially troublesome for me because it wasn’t conducive for the stanch I needed to hit my draw. Because of this, I couldn’t get comfortable over the shot. That’s when Bruce stepped in and redirected me. “Take it off the right side of the bridge,” he said, causing me to focus left instead of right. This created a dilemma. Hitting where Bruce recommended meant playing a cut, an uncertain outcome from me. Part of the allure of playing right was a bail-out area, where I could still recover for birdie if I didn’t completely pull off the approach. Seeing I was still debating, Bruce provided the closing argument. With that, I settled in on the recommended line, and when I planted my lead leg, it felt solid. And I’d now be swinging more with the slope than against it. I was all in. And I fired. The ball shot out like a pin-seeking dart. Tracking at the hole all the way, it easily carried the creek, hit short of the flagstick and rolled 15 feet past. “That’s the best shot you’ve ever hit in your life, bro!” Bruce shouted, and high-fives and fist bumps ensued. On the green, Bruce guided me to a two-putt birdie and later blamed himself for costing me eagle. No complaints here, Bruce. That was no gimme. Having pocketed two birdies for the round, I was more than satisfied with my play for the day, but we still had one hole to go – a 146-yard par-3. The hole was playing longer because the pin was tucked on the back tier. I was thinking of playing safe, but Bruce handed me my 8 and told me to go right at it. So I did. Six feet. Another round of cheers broke out, making me suddenly feel like I had my own gallery. Bruce greeted me at the cart by handing me my Cleveland putter and on the green he provided me with a two-word read on the putt. Straight in. And it was. Birdie! Four birdies in a round is my record, and it wasn’t on a course nearly the caliber of Sherwood. I walked off the last hole on a golf high and ready to play 18 more. But alas we were done, and it’s probably better that way. You don’t mess with walk-off birdies. That was a first for me. Anyway, a day like that makes you ponder the possibilities for your game. What if I had a Bruce for every round I played? Dare to dream. Friday it was back to the reality of approaches that just miss the green and birdie putts that don’t quite find the hole. As we parted in the parking lot on Monday, I joked with Bruce that I’d like to have him in an app. that I could just open and point at the course when I needed a yardage, a read, or even maybe just a little comedic a relief. Only I wasn’t joking. Move over, Siri. I want Bruce. I’m not sure this photo quite captures what a cool little hole this really is, but this is one of my favorite par-3s in the area. This is No. 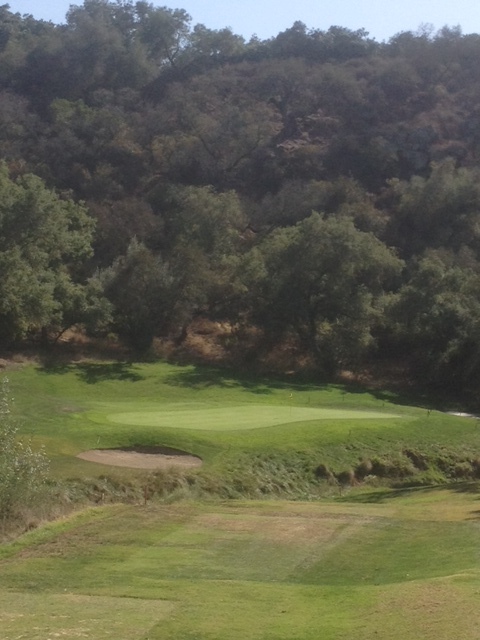 17 at Cross Creek in Temecula. It’s a gem of a hole on a hidden gem of a course. Cross Creek is on the other side of the mountains west of Old Town Temecula, where there’s little reason to suspect a golf course exists. But one does, and it’s worth checking out. The secluded location and lack of nearby homes makes for a serene golf experience on a course that just seems to roll along the countryside giving you consistently great and unique golf holes one after the next. You come to No. 17 after a pair of testy par-4s, and this little par-3 is off to the right of the 18th tee box, kind of off in its own little world, framed by the trees and fronted by a creek. 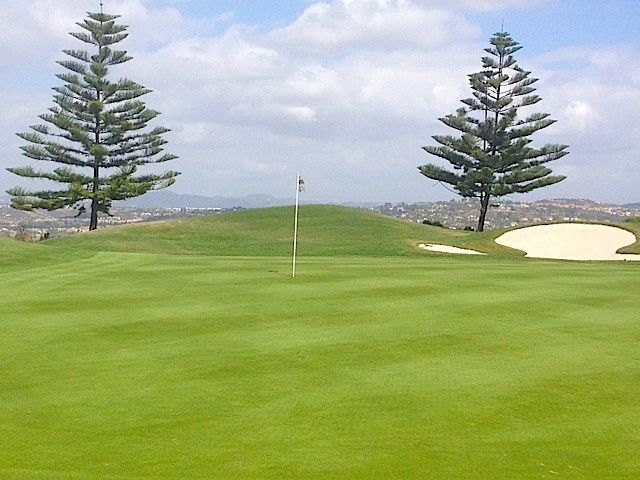 It’s got a gently sloping green that provides for multiple challenging pin locations. The hole plays 170 yards from the tips and a mere 137 yards from the golds. It’s tempting to go pin-seeking here because that’s exactly what the hole’s tempting you to do. But beware that if you clear the creek but end up short, the rough you’re in is ankle-high and no picnic to get out of. On the other hand, go long here and you’ve plenty of room to recover and save par. In other words, when in doubt, take an extra club. The wind can also tricky on this hole. The day we played, the Santa Ana’s were howling, but the 17 green seemed protected from the wind enough to be unaffected, although we could feel the wind on the tee. But the winds were also coming from an unusual direction that day we were told. Wind behind you could make a big difference here. Anyway, if anyone reads this who has played this hole and wants to toss in their two cents, feel free, but this is the hole I think of when I think of Cross Creek. I’ve made birdie, par and bogey here and each one has given me a different appreciation for the challenge this hole presents. I look forward to it every time.